“The Lady of Eryneth cast one final spell. Slowly but surely, the enchanted Elven Kingdom of Eryneth shimmers into oblivion. The forest returns to its original form as if nothing has changed in nearly a thousand years. The soaring glittering Elven trees have all but gone, the towering archways carved out of the ancient forests' canopies are no more, and the Great Hall of Eryneth is now just a bare meadow in the shadows of the forest. 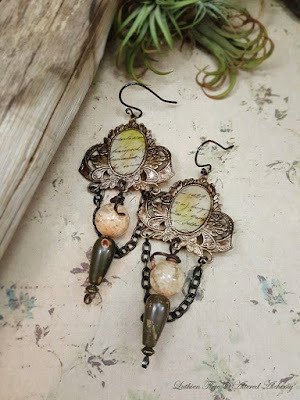 Join me this year between June 6 - July 17, for 6 weeks of creative fun in the realm of mixed media, and maybe at the end of my class, you'd be the lucky winner of this pair of old-world bohemian earrings too!